Farmind has developed a nationwide system for providing volume retailers with temporary staff to handle in-store product demonstrations with a focus on food products. We offer full support for sales promotion activities, including food samplings and various promotional events. Farmind temps are trained in communicating products’ features and values to customers in volume retailers’ stores, illuminating the products’ benefits and encouraging purchasing behavior. Operating according to this basic concept, we have fostered a large pool of sales personnel equipped with sales skills, knowledge and know-how to support stores by strengthening their sales. Our proprietary staff education system has been adopted by all our business bases in Japan to enable nationwide implementation of standardized in-store sales training programs. 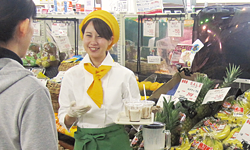 Administrative personnel make routine visits to the stores, where they also conduct on-the-job training (OJT) and gather feedback from store management personnel. After completion of a program, we follow up with after-sales services, such as analysis of the actual sales data and provision of photos of the promotional activities. Full support for planning and implementation of in-store events is provided in collaboration with Farmind FMDs (field merchandisers). We provide skilled temporary staff to meet companies’ manpower needs, in foods as well as in other fields. Our staff are prepared to assist clients with tasks ranging from OA input to accounting work. Contact us for a consultation, whatever your needs may be. ●We offer carefully structured systems for conducting education in confidentiality obligations and personal information management.